This is a drop in event but we have made half the paces bookable to ensure those really keen get to have a go. If all the tickets on here are gone, there will be some spaces left during the drop in sessions. 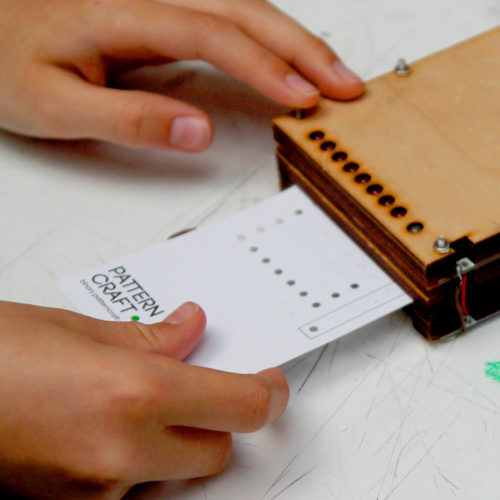 PatternCraft is a tool for exploring the fundamentals of encoding and decoding data through the write-once medium of a physical punchcard. In this workshop participants will learn how to program Minecraft using a set of punchcard commands and will be introduced to a number of ways that data can be encoded including binary and Morse code. A workshop teaching people to mend holes in fabric using centuries old stitching techniques. Michael Borkowsky's perfume making workshops give participants the opportunity to learn more about the perfume making process and how it can be applied to portraiture.